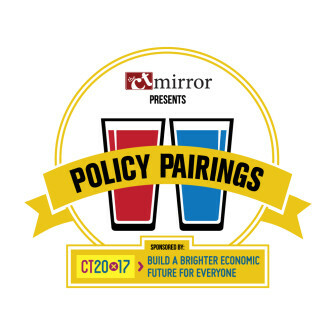 Connecticut homegrown breweries served as the backdrops for discussion of pressing state issues as part of The Connecticut Mirror’s first “Policy Pairings Series.” Watch the panel discussions in their entirety below. When a legislative panel began looking at Connecticut’s local and state tax structure in late 2014, the 16-person committee set out to examine the income, business, consumer and property tax systems in Connecticut. The Mirror panel discusses government and business perspectives on the long-term future of taxes in the state. Panelists included Kevin Lembo, Connecticut state comptroller; Sen. Scott Frantz, R-36th District, ranking member, Finance, Revenue and Bonding Committee and co-chairman of the study panel; and Stephen LaRosa, senior director, state and local tax, Alexion Pharmaceuticals Inc. The panel was moderated by Mirror Budget Reporter Keith M. Phaneuf. Between tolls and the proposed widening of I-95 from New York to Rhode Island, the debate continues regarding the future of Connecticut roads. How will the governor’s transportation vision be funded? What is needed to successfully upgrade the state’s long-neglected transportation system? These questions and more were discussed from three perspectives. Panelists included James Redeker, Connecticut transportation commissioner; Sen. Toni Boucher, R-26th District, ranking member, Transportation Committee; and Michael Riley, president, Motor Transport Association of Connecticut. The panel was moderated by Mirror Capitol Bureau Chief Mark Pazniokas. This panel took a long view on the business climate in the state, exploring how decisions made now will affect Connecticut industries and small businesses. Panelists were Connecticut Gov. Dannel P. Malloy; Joe Brennan, president and CEO of the Connecticut Business & Industry Association; and Oz Griebel, president and CEO of MetroHartford Alliance. The panel was moderated by Mirror Capitol Bureau Chief Mark Pazniokas.